This 12 mm long bug was found feeding on developing seed heads of Alkali Goldenbush (Isocoma acradenia) near Bumblebee, Yavapai Co., Arizona, 27 Sept. 2008. Say's Stinkbug is mostly green with an orange-white border around the perimeter. There is also usually a spot of orange at the tip of the scutellum - the triangular plate top center. Mostly common in riparian habitats and along edges of agricultural areas in the Sonoran Desert. 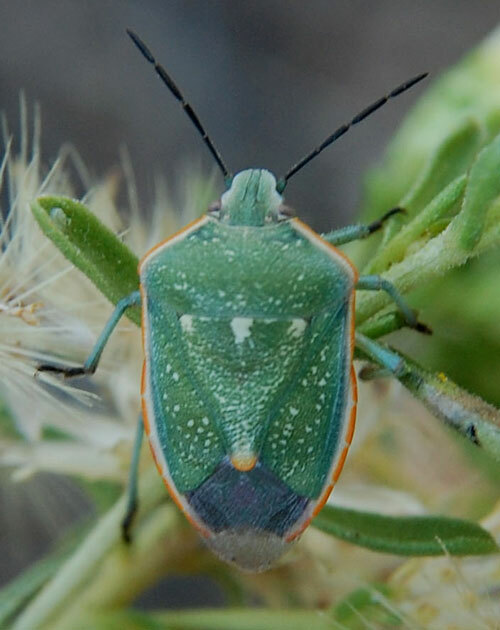 This bug is an occasional pest in grain and other crops. It feeds by inserting its piercing-sucking proboscis into tender developing seeds and buds and withdrawing sap. Feeding sites may wither and seeds/fruit may not fully develop.